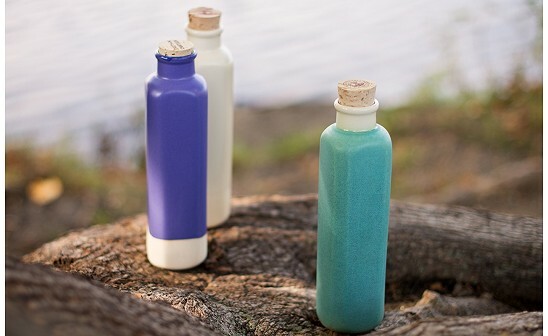 The Earth-In Canteen is a simply lovely way to drink water--a sustainable clay water bottle that’s Made in the USA. For hundreds of years, civilizations used clay to carry water. It’s a natural insulator that maintains water at a comfortable drinking temperature. The Earth-In Canteen builds on that conventional wisdom. The stoneware vessel is made from American clay that is fired and glazed in California. 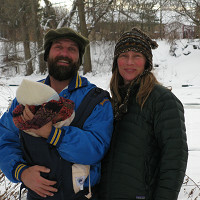 Founders Kathy and Richard Staychock have been on a mission to reduce plastic water bottle use for years. In 2002, they helped develop a water bottle company that sold steel water bottles. The Earth-In Canteen is a natural evolution for them, to a more organic material that can be produced here in America and offers a clean, non-metallic taste. The Earth-In Canteen is sturdy but surprisingly lightweight. Beautifully designed and packaged, whether you use it at home or the office or give it as a gift, it will turn hydration into a sophisticated event. I’m Kathy Staychock the co-founder of Earth-In Canteen. 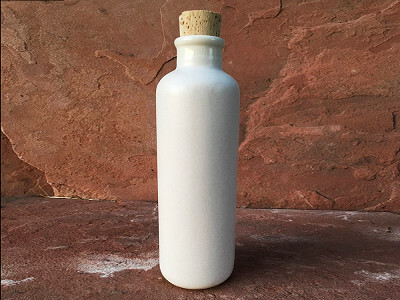 Made in Northern California from local CA clay and lead-free glazes, Earth-In Canteen is a natural return to a stoneware water bottle. It's not just for water.. you can use an Earth-In for bulk olive oils, homemade vinaigrettes, flowers, wine, whatever! We invite you to experience the peace of drinking pure water from an American-made, easy-on-the-earth, perfectly natural canteen. Thanks, Grommet for featuring our canteens! It's so great to be here..
@Kathy How wide is the mouth? Will an ice cube fit? It looks a bit delicate...I love this idea! I carry water with me everywhere Will it hold up? @Jill It's more durable than it looks. We fire the canteens at cone 10 meaning they're considered stoneware.. as durable as it gets for ceramics. I've put my Earth-In Canteen to the test: rode with it 50 miles on a ride to Monterey and also use it daily around the house, office and in the car since it fits the cup holder. Thanks for asking. @Kathy - Thank you! I am going to order 3 of them! @Jill Awesome! Thanks for the support! Growing up in India, I am used to drinking water from an unglazed clay pot that would keep water naturally cool. I am wondering if the glazing reduces the cooling effect with your bottles, any insights on that will be helpful. Also, what is the size of the bottle? I am trying to determine if it will fit in the cupholders of my wife's car. The glazing should not reduce the cooling effect. @Marcia I'm not trying to be difficult, but I believe Swaminathan is right - a glaze would prevent the COOLING properties he has experienced. It would probably not affect the INSULATING properties - in other words the water might stay cold longer than it would in a canteen of metal, for example. But your glazed canteens would NOT actually make the water cooler than it was when you put it in. The unglazed clay pot he grew up with actually made the water cooler because some water seeped through the ceramic and evaporated off the surface. A glazed vessel would not allow water to seep to the outside surface and evaporate. @mary Hi Mary, Yes the canteens are dishwasher safe just like your everyday plates and mugs. The canteens are intended for drinking water but work fine for hot drinks-- like a thinner coffee mug without a handle. The Grommet is offering our canteens in three glaze colors: Violet purple, Sea Glass turquoise, and clear glaze which shows the natural off-white natural clay. @Narvin Hi Narvin, I wouldn't claim 'leak-proof' since each canteen is slightly unique like each cork stopper. The cork stopper will form over time to create a tight seal. Howdy! Wondering if you put ice cubes in this Canteen, will the outside 'sweat' with condensation? @Dennis yes ice cubes fit no problem. The outside sweats a little just like a glazed coffee mug might but not as much as a single walled metal bottle or plastic water bottle. I'm in a dry climate and my canteen full of ice water and it's dry to the touch..
this is a perfect receptacle for my desk I've been looking for! will it retain oder/staining from other liquids when you want to use it for water again? @christopher sorry, particularly the cork, and what are cleaning directions? @christopher Great to hear! I'm at my desk now enjoying mine :) Like your plates and coffee mugs, the ceramic Earth-In won't retain odor, stain or flavor from anything once you rinse, wash with soapy water or run it through the dishwasher. The bottles are glazed on the inside and outside to nothing will absorb. @Kathy the cork is porous but naturally anti-fungal. The cork stoppers can be washed gently in warm soapy water, rinsed well and dried in the sun. I suggest using one cork for water and another for other liquids like tea or oils. Replacement corks are inexpensive. @Kathy good to know about the cork, do you offer replacements, and if used exclusively for water, how long to suggest before replacing? @christopher sorry to leave you hanging.. yes we offer replacements, if needed. I've been using this one cork for about six months now without any problems. Cork is a pretty amazing natural material..
@Kathy that's ok, ordered before you did, again, great for around the home/computer desk especially, and can keep out overnight for in the morning. (I'm in a wheelchair) thank you so much, Kathy. 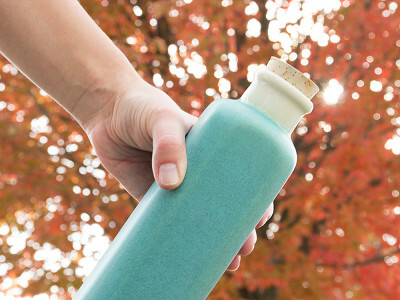 The Earth-In Canteen is a simply lovely way to drink water--a sustainable clay water bottle that’s Made in the USA. For hundreds of years, civilizations used clay to carry water. It’s a natural insulator that maintains water at a comfortable drinking temperature. The Earth-In Canteen builds on that conventional wisdom. The stoneware vessel is made from American clay that is fired and glazed in California. Founders Kathy and Richard Staychock have been on a mission to reduce plastic water bottle use for years. In 2002, they helped develop a water bottle company that sold steel water bottles. The Earth-In Canteen is a natural evolution for them, to a more organic material that can be produced here in America and offers a clean, non-metallic taste.